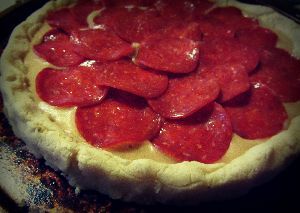 Are you looking for how to create easy gluten free pepperoni pizza recipe? 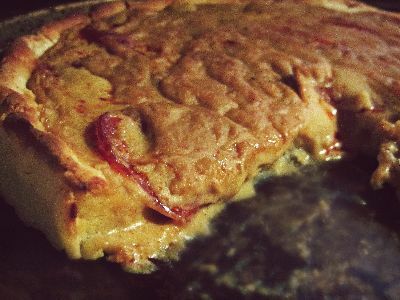 Try this simple pizza crust recipe along with this dairy free recipe for a cheese sauce and add your choice of pepperoni or other toppings. This crust came out very delicious with a nice light crunchy crust. Start by placing a medium size pan of water on the stove and bring to a boil. Peel and cube potatoes and place in the boiling water. Boil until soft (approx. 15-25mins). Heat the milk and stock in a bowl for approx. 2 mins. Combine active dry yeast, and sugar, stir gently and allow it to sit for 5 minutes. Mash the potatoes until all the lumps are gone and mix into the yeast mix, stir. Add in olive oil and salt, mix then slowly add in flour. Stir using a dough mixer or use your hands until all ingredients are mixed. Slowly knead for a couple of minutes. Flatten the dough in the mixing bowl and lightly coat with olive oil (approx. ½ tsp). Cover with wet paper towels, place in a warm area and allow the dough to sit for 10 minutes. Pre-heat oven to 425 and lightly grease a pizza pan. After 10 minutes gently knead the pizza dough and roll out onto pizza pan pressing the dough from the center out to the sides until dough is approx. 1 inch thick. Press up sides like a pizza crust and to help hold in cheese sauce. Place dough without toppings in the oven and bake for 10 to 15 minutes until lightly golden. While the dough is cooking make the dairy free recipes cheese sauce. Remove dough from oven and coat with half of the cheese sauce then in a circular direction lay out the pepperoni over the cheese. Pour remaining cheese sauce over the pepperoni and place the pizza back in the oven for 20 to 30 minutes until center of crust is cooked. Did you enjoy this pizza? Try this Pizza Crust and tell us what you think. Do you have gluten free or allergy safe crust that you would like to share? Click here to contact us! Return from Pizza Recipes to Food Allergies Home Page!